Pretérito indefinido o pretérito perfecto simple (both names can be used for this tense) of the indicative mood is one of the past tenses in Spanish. Note: the 1st person plural of the verbs ending in -ar and -ir are the same in pretérito indefinido and present tense, but thanks to the context we can know what they refer to. When do we use pretérito indefinido? 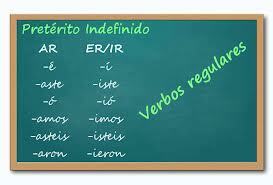 Generally speaking, pretérito indefinido is used for actions in the past that are seen as completed. Use of the preterite tense implies that the past action had a definite beginning and definite end, althought the beginning and the end may not always be clearly stated. Juan caminó de la una hasta las dos. Juan walked from one until two o’clock. Juan walked for two hours. Juan caminó con un amigo. Juan walked with a friend. Now you can complete the following exercise to practice. Tip: mind the accents (the vowels which have to be stressed) because in other case, the answer is not considered right. Teacher of Spanish as a foreign language. Professor of Philosophy. University of Buenos Aires. Passions: I love writing.